REGURGITATOR yeah it’s on… new show Peregian ORIGINALS on Sunshine Coast. REGURGITATOR so yeah it’s on… this week is here! 3 sets back into things… after a warmly received performance at the excellent Townsville Cultural Festival on Saturday just past the Cheap imitations… touché kicks off this week with 2 nights at The Zoo in Brisbane and the Manning Bar in Sydney. With the Friday Zoo show sold out sometime ago and the Thursday Zoo show and Manning tossing around about 100 presales or so left good chance they will be gone before the guys hit the stage handlebars and all… similar for The Prince. All other shows are sold out. 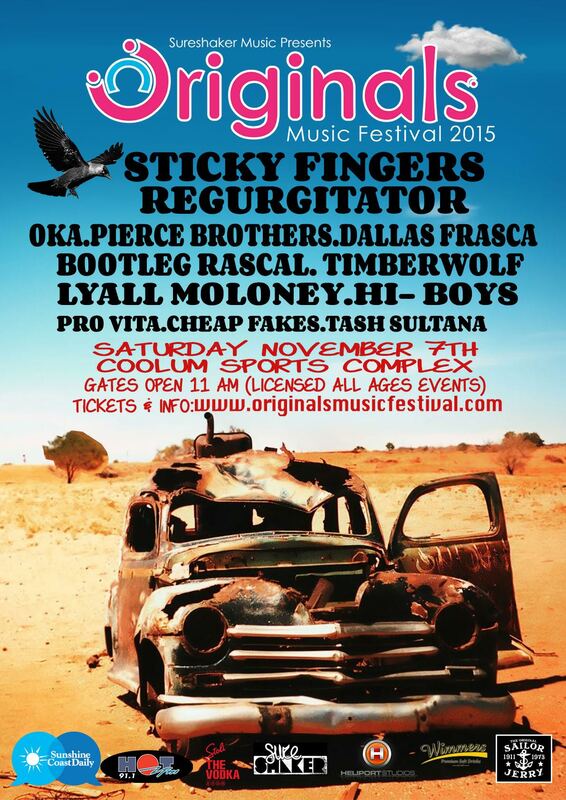 Off the back of all of this two more chances for the guys to play have emerged – SATURDAY 7th NOVEMBER at the next Peregian ORIGINALS festival at Coolum Sport Complex with Stickyfingers and more. And then a Newcastle show with the Back to the Bar Alumni Reunion (main event of UON’s Alumni Homecoming) on THUR 22 OCT at the scene of many a crazy night – Bar the Hill, The University of Newcastle. Open to past students and their guests only sorry to say. Nothing Less than Cheap Imitations… verging on 22 years since forming late 1993 and playing 800 plus live forays from their first public performance early 1994, Regurgitator will release their debut live album around their upcoming Cheap Imitations tour. Regurgitator have always embraced their flaws, their limits, fucked with technology, genre… the entire twisted process. Worked it as hard as they could, pushed all over the place in the quest for bettering themselves, shifted farther and faster than could stay on their feet, and endured time stronger for it. In the end what is the imitation but a simulacrum of the live performance… the meticulous production of the recording versus the spontaneous energy of the in-the-moment live representation of the song. And now the meta-imitation with all the spikes and bumps of this raw and inspired collection of live recordings dating back to Oct 2012 captured over two crazy nights at The HiFi, Melbourne – Nothing Less than Cheap Imitations. And look for a new solo album from Ben Ely coming late October – Goodbye Machine. THUR 27 AUG Brisbane THE ZOO – selling fast! FRI 28 AUG Brisbane THE ZOO – SOLD OUT!!! Tickets from zoo.oztix.com.au, all Oztix outlets and regurgitator.oztix.com.au. SAT 29 AUG Sydney MANNING BAR – selling fast! Tickets from venue, www.manningbar.com, all Oztix outlets and regurgitator.oztix.com.au. FRI 4 SEPT Melbourne THE PRINCE – selling fast! Tickets from www.princebandroom.com.au, all Oztix outlets and regurgitator.oztix.com.au. SAT 5 SEPT Adelaide THE GOV – SOLD OUT!!! Coolum Sports Complex from 11am. Nothing Less than Cheap Imitations: Live at The HiFi Melbourne Oct 2012 – available SEPT 4 via Valve/MGM and at the shows. Say no to toxic crap… social injustice, inequality, environmental abuse, homophobia, and violence towards women.